Cars take a bath at Silverstone Classic. Indoors at the Silverstone Auction was the best place to be on the Classic weekend as rain was incessant for two days. 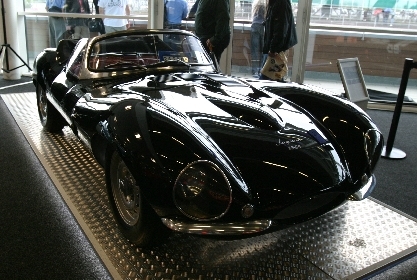 This XKSS replica was one of the Jaguars on offer and did not sell. Other Jaguars on offer included a couple of E types and a 2700 mile XJS that sold for £22,250. The group 44 liveried XJS of Chris Ward qualified 2nd but only managed 9th in the race. Gary Pearson in a Knobly Lister was placed 2nd in the Stirling Moss Trophy with another Lister Knobbly in 3rd and the Lister Costin in 5th. Chris Ward qualified his D type on pole but only managed 8th in the race. Qualifying 6th in the pre-66 Classic GT race was the E type of Clark and Shaw. Taking 18th at the end. Qualifying 21st in the pre-66 Classic GT race was the E type of Grey and Brewer. Two laps down in 25th at the end of the 25 lap race. In the HSCC Guards Trophy they finished 29th. The XKR14 of D'Ansembourg who won his race ahead of a Nissan and Porsche 962. Group C cars are quite a handful let alone adding a wet track. Richard Eyre qualified the XJR16 in 12th position on the grid and managed to work his way up to 4th by the time the chequered flag fell. Clark and Oliver qualified their E type in 39 out of 40 and stormed through the cars to finish 10th in the pre-63 GT race. Former Touring Car driver John Cleland put his E type on 33rd for the Guards Trophy race and finished 1 lap down in 22nd . Looking more like a skating rink than a race circuiit the drivers did well in atrocious conditions. Grahame Bull qualified in 10th and finished 16th.